$500 Earn $500 bonus cash back after you spend $3,000 on purchases in the first 3 months from account opening. Simplifying credit card rewards for business owners. Forget about purchase categories, bonus category activation, point redemption, etc. Use this card for your business expenses and earn 1.5% cash back on every purchase. This business credit card is one of our top picks for the best credit cards of 2019. 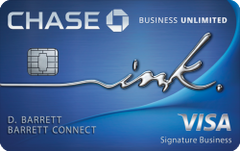 Our take: Business owners who want to “set it and forget it” will enjoy earning unlimited 1.5 percent cash back with the new Ink Business Unlimited card.